Never heard of Mel Martin? Countless direct response marketers and copywriters — some with a very high level of attainment — greet his name with a blank stare. After Gene Schwartz helped Marty Edelston lay the foundation for Boardroom, it was Mel Martin’s copywriting fascinations that turned it into a $100 million a year operation. He was so critical to Boardroom’s success, his name was kept a secret for fear he’d be snatched up by another company. Even today, many copywriting bullets are rubber on impact. The prospect glances over them and returns to business unfazed. Prior to Mel Martin, most bullets were just typographical symbols wedged next to a benefit. Mel changed the game and his ads successfully sold everything from cook books to almanacs to guides on continuing education. Want to learn the secret to writing bullets that automatically draw friends, power, love, money far beyond your fondest dreams into your life OVERNIGHT? See page 294. 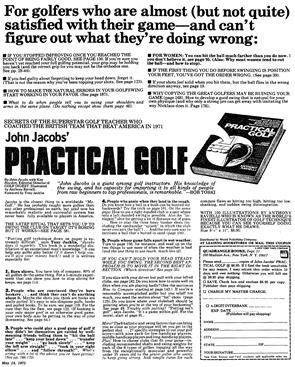 Just click this link for one of Mel’s ads: For golfers who are almost (but not quite) satisfied with their game — and can’t figure out what they’re doing wrong. That’s because once his direct mail ad copy began mailing in the millions, his employer, Boardroom Inc., kept him under look and key for fear he’d be siphoned away by a competitor. This video highlights his space ads which sold millions of books for a division of the New York Times called Quadrangle. Here are the 4 ads shown in the video in one downloadable PDF. 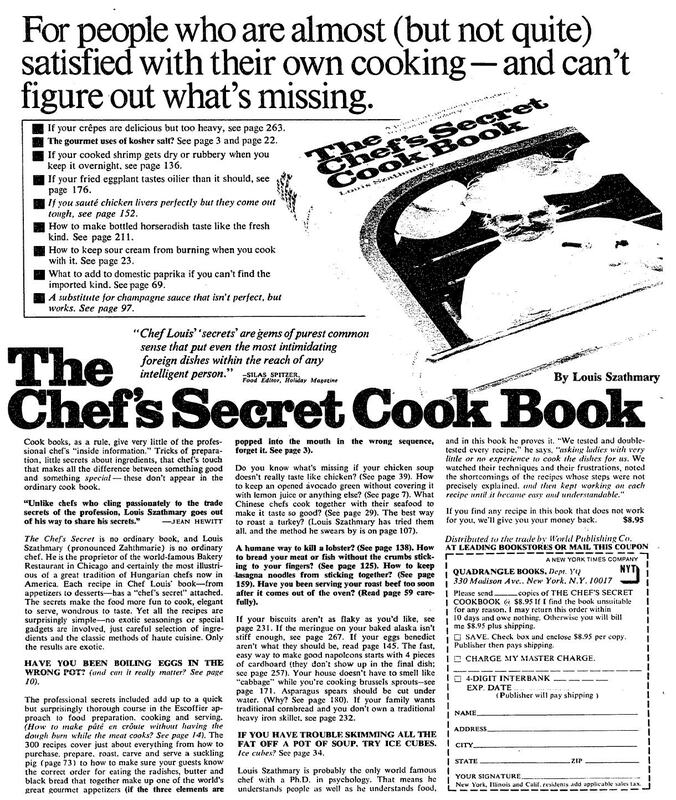 For people who are almost (but not quite) satisfied with their own cooking — and can’t figure out what’s missing. • If your crepes are delicious but too heavy, see page 263. • The gourmet uses of kosher salt? See page 3 and page 22.
keep it overnight. see page 136.
with it. See page 23.
imported kind. See page 69.